Allegion creates peace of mind by pioneering safety and security. As a $2 billion provider of security solutions for homes and businesses, Allegion employs more than 8,000 people and sells products in more than 120 countries across the world. Allegion comprises 27 global brands, including strategic brands CISA®, Interflex®, LCN®, Schlage® and Von Duprin®. Allegion has thousands of customers searching for detailed product information and customer support questions in huge volumes. Customers had questions that were time sensitive and urgent. 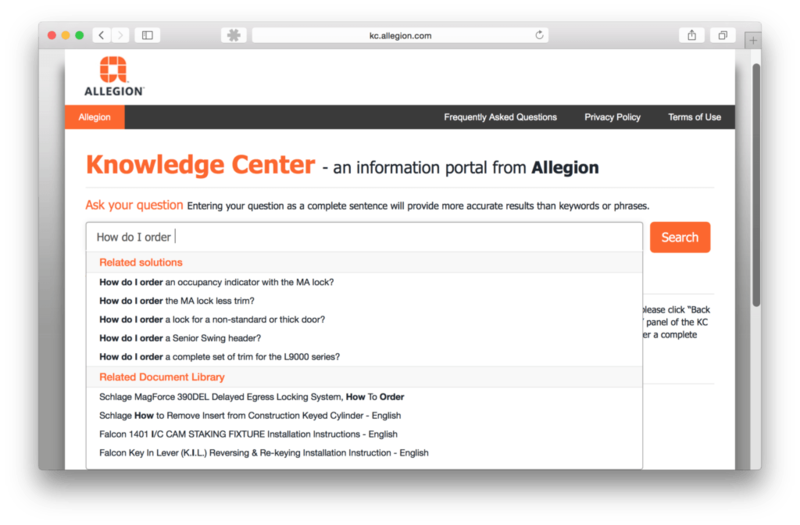 Allegion wanted to provide answers to their customers as quickly as possible as well as providing answers from all different section for the knowledge base including their document library. They needed a super-powered and intelligent search that goes beyond keyword matches. By utilizing Inbenta’s intelligent search with dynamic FAQs, they are able to provide accurate answers to questions, without making customers submit a ticket or call the call center. This makes reduces their customer support costs and most importantly, makes their customers happy.